HANOVER, Germany — Touting technology that is as “easy to use as a smartphone,” Daimler AG on Sept. 18 showcased safety systems on the next generation of its global highway tractor that it said points the way forward for connectivity in the commercial sector. 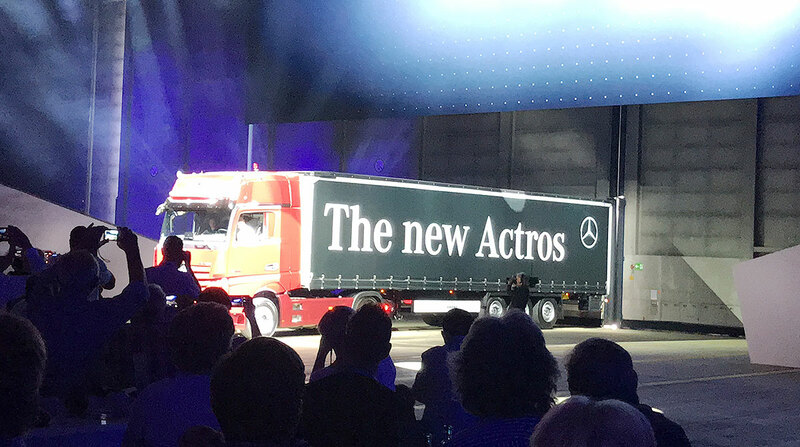 Hosting 500 members of the international press from 45 countries in a hangar at the Hanover airport, Daimler in a media event prior to IAA 2018 showcased its new Mercedes-Benz Actros highway tractor, a key component of its global lineup and a vehicle that features a suite of technologies that the company says will make the truck a safer tool for its customers. That includes a suite of safety systems designed to limit the potential for accidents, including Active Drive Assist, which will intervene if, for example, a truck accidentally leaves its lane due to wind. In this case, the system will steer the truck back into its lane. This system also will apply brakes if it detects an object in the vehicle’s way or if the truck gets too close to another vehicle. Also included is Active Brake Assist 5, an enhancement of Active Brake Assist 4 that improves how the radar and camera systems interact and which can react to people that cross the vehicle’s path at speeds of up to 50 kph (31 mph). The system can apply full braking in these cases. If the system detects either a pedestrian or a stationary object, the system alerts the driver through a multistage warning system. If the driver does not intervene, the system will apply emergency braking, within specified limits. Daimler also is introducing its “MirrorCam” technology on the truck, which uses cameras to replace mirrors. The system, Buchner said, gives the driver “much-better all-around visibility from the interior — the driver can see exactly what the cameras are seeing,” via screens inside the cab. This includes multiple camera functions, including one that resembles the view of a conventional mirror, along with a view shown when taking corners that includes the tractor and trailer, Daimler said. Distance lines also are incorporated to help the driver assess traffic coming up from behind. There also is an additional line that can be individually set to show the end of the trailer. When the vehicle is reversing, the system gives the driver a split view; the upper section of the display shows the area closer to the truck, while the lower part displays the area away from the vehicle. “We are not only thinking about the future — we are creating it,” Buchner said. The company’s near-term future in terms of sales is bright, said Martin Daum, global head of Daimler Trucks and Buses. In introductory remarks, he said orders are up 30% for the first half of the year and that Daimler “remains optimistic” for the rest of 2018. He said the company is “basically sold out for the year” and predicted that 2018 will be a record year for the manufacturer. “We are very busy these days,” he said. Separately, Daum announced that Daimler is investing in Burlingame, Calif.-based Proterra Inc., a manufacturer of electric charging systems, to explore the electrification of select Daimler heavy-duty vehicles. Initially they will seek synergies with Daimler’s Thomas Built Buses division by bringing Proterra’s battery and drivetrain technologies to the North American school bus market. “We expect the cooperation with Proterra to deliver additional impetus for the development of heavy-duty commercial vehicles with electric drive. In this way, we are broadening our scope in particular concerning the key technology of the battery — also with regard to North America,” Daum said.